It is now only ten days until the 50th anniversary of The Man and the Hour being first broadcast and today is another anniversary – 45 years ago, in 22 July 1973 the episode The Recruit was recorded. We featured this episode before as it was the first in which James Beck did not appear at all (he was in hospital it this time). For this clip we move on from the sad absence of Walker to happier matters – the recruitment of some new platoon members. The Vicar and Verger had been relatively minor characters up to this point in the series’ development, though they would feature increasingly often from this point on. In this episode they are at the centre of a plot which sees Mainwaring laid-up with ingrowing toenails. Wilson takes the opportunity to mount a recruitment-drive and Rev. Farthing is the first to apply; and as whither his reverence goes, there goeth Mr Yeatman, the platoon gets two for the price of one. Despite their experience with the Scouts neither of them seem particularly well-suited to military life and the unwelcome arrival of Warden Hodges Scottish nephew, Hamish, leads to unrest in the ranks. 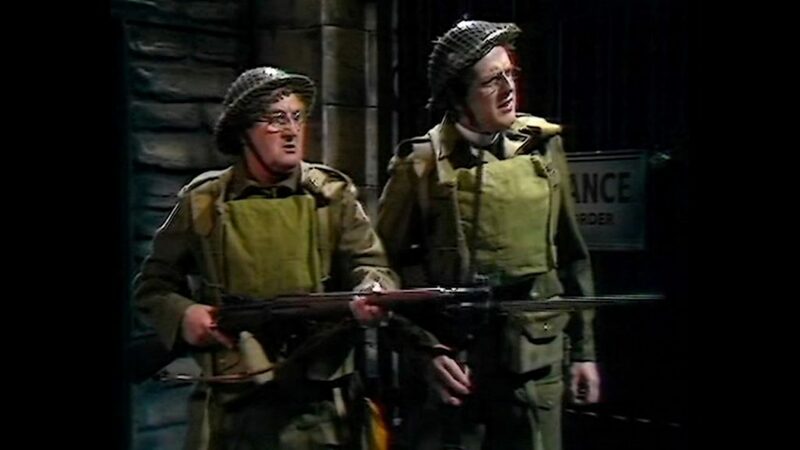 Order is restored when Mainwaring returns, reasserts control and the vicar and verger throw in the towel (or to be precise, their silly trousers). This entry was posted in blog on July 22, 2018 by wolAdmin.